This has to be the work of an intern. There is no way that someone should get paid for this work! haha! what a poorly done review. After initially being rather harsh in my assessment of this review on the main thread, I actually think it's possible that the reviewer was deliberately giving as few 'spoilers' away as possible given how early this review has been published. I mean, there's a reason that all these people who have heard the album already haven't already published their reviews yet. Warner will not want all these reviews to appear so early, divulging all the details of the record and diminishing the expectation and curiosity that will surround the build-up to this album (provided it doesn't leak too early). Jesus Christ people. Surely you realise how ridiculous you sound? Oh, by all means. But then, the general levels of anticipation/demand/craving for the new album felt by most of us here have reached such ridiculous levels over the past few months anyway; why not post ridiculous dissections of vague but positive reviews? At least it's, y'know, relevant to the band and this forum's general purpose, which is more than can be said for about half the posts made in the main thread. (Dammit Volta, what have you done to me? I've almost become some raving madman over this album....and it's all Octa's fault . If it had been more than merely 'alright', I'm certain that my pathetic 'need' for this album would not be at these levels). Could someone please re-post the review? The pic is gone. They found the song confusing -- fair play by me. At least they didn't react with knee-jerk negativity. the announcement of the return At the Drive-In to the stage has attracted considerable alborto, but the expected meeting should not overshadow the fact that Cedric Bixler-Zavala and Omar Rodriguez-Lopez and have to come out of the oven another excellent album the Mars Volta. and we say knowingly, because we could hear it. "Noctourniquet", so called his sixth book, contains 13 tracks, with titles like "the whip hand", "dyslexicon", "in absentia", or "molochwalker" which condense his usual progressive tendencies on issues more concise (only a couple spend 6 minutes) and with some electronic touches in the production, which gives a different look in terms of sound and has led to Cedric to define it as "futuristic punk." still, that no one expected a radical change, as the band's label is still very present. Out in Spain next Wednesday. So this is out today then? Hope someone can grab a copy! A friend of mine who lives in Barcelona bought one for me but I'm not sure I will get it soon. �I am a landmine, I AM A LANDMINE!� shrieks Cedric Bixler-Zavala, amidst the frenzied conclusion of �The Whip Hand�, a blistering opening salvo to sixth studio album Noctourniquet. 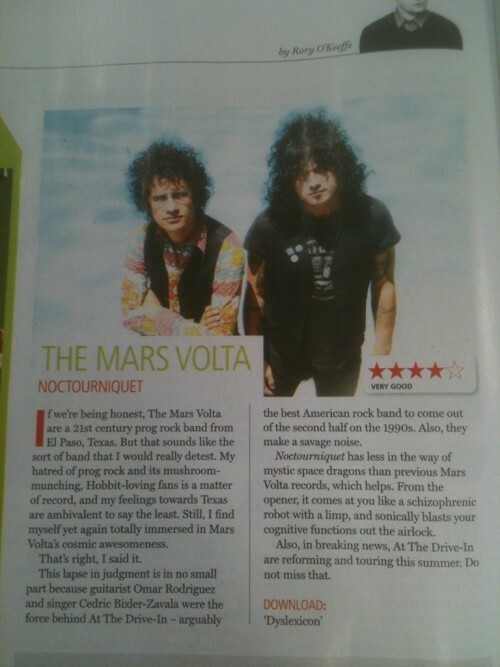 It is a fervent reminder that rumours of The Mars Volta�s demise have been greatly exaggerated. When At The Drive-In burst back into life in January, breaking a 11-year silence and confirming a long overdue reunion, some concern arose amid the celebrations. What would become of The Mars Volta, one of the bands that sprang up from ATDI�s apparent demise? On the evidence of Noctourniquet, there�s little cause for alarm. Their palate has always been a progressive combination of At The Drive-In�s intensity (employed more sparingly) and their own skill at weaving breathy, patient soundscapes. This latest effort harnesses that sound, delivering moments of propulsive aggression (�Aegis�), thoughtful contemplation (�Lapochka�) and haunting beauty (�Empty Vessels Make The Loudest Sound�). Like any experimental album, Noctourniquet is often demanding, but the rewards are plenty, not least Bixler-Zavala�s hypnotic vocals, which continue to amaze as they seamlessly flip from banshee-like wails to quiet refrains over the course of 65 minutes. As you pore over the dark nursery rhymes of �The Malkin Jewel� and the emphatic title-track, his presence hits you harder than ever. The Texan is as challenging and uncompromising a presence as his band�s latest record. Music desperately needs frontmen like him right now. Sweeeeeeet! I'm geting more excited every day! EDIT: I guess this one got taken down, apparently it was just a fan review and none are supposed to go up until the official release. Meh, I'll leave the transcript up until they post something different. The Mars Volta reflect on past ventures and fuse these past tendencies into a new sound. A Supernova of anarchical psychedelia, to sounds that induce a hypnotic ambience while projecting a delicate atmosphere. Meditative voyages exploring the realms of not only the music at hand, but a personal odyssey where the musician discovers their full potential, and then goes even further. And all of these different musical approaches are often decorated with cryptical lyricism which are often expressed in ominous metaphorical ambiguity- This is the music of The Mars Volta. The main creative force behind The Mars Volta has always been the collaboration between, Cedric Bixler-Zavala and Omar Rodriguez-Lopez, and throughout the years we have seen these two musicians evolve in such a way that is rarely seen. From their origins as members of renowned Punk band, At The Drive-In, to their brief time as the Dub/Reggae outfit, De Facto, and now as the composers of the Progressive musical act, The Mars Volta. In the past decade we have seen The Mars Volta compose an illustrious discography. From their early orchestrations of Psychedelia, yet aggressive in nature, the music displayed an emphasis on atmospheric compositions. In their latter efforts the band begun to exhibit a much more experimental agenda, embracing their Progressive Rock influences as ambient decorations begin to play much more prominent roles. But their music often incorporated elements of Jazz, as the musicians developed a connection with their instruments and letting their hands and fingers translate the passion from their souls into surrealistic performances consisting of sounds so versatile ranging from delicate ballads, to intense explosions of musical improvisation. and of course, there is the voice of The Mars Volta, Cedric Bixler-Zavala, whose voice has a such a range that can at times sound ethereal and delicate, to a malevolent roar of vivd passion. But of course, t's no secret that the band's main composer and visionary has always been it's lead guitarist, Omar Rodriguez-Lopez. And aside from his work with The Mars Volta, he has begun to explore his own musical ambitions, though the two sides often interact. Omar's solo releases have often served as a window into the direction of where he was going to take The Mars Volta on upcoming albums. And if we refer to the recent albums that Omar has released under his solo moniker, we can see that Omar has diverted from the more improvisational and Jazz influenced style, and has embraced a much more restrained sound. Noctourniquet truly reflects the compositions of Omar's Un Escorpi�n Perfumado. In Un Escorpi�n Perfumado, we find Omar fusing the improvisational atmosphere of his past works with a pop-musical structure. There is a significant absence of moments of energetic improvisation that once dominated the overall sound of Omar's albums. But now, the music is orchestrated with restrain as a barrage of instruments work together to create a deranged sense of psychedelia. Noctourniquet is an amalgamation of everything we have already heard from Omar and Cedric in the past. Instead of actually evolving into a different musical approach, we see The Mars Volta regressing into past ventures and fusing these past tendencies into a new sound. A song like, "Dyslexicon", displays the typical paradigm for the album. Noctouriniquet exhibits the traditional musical structure of it's predecessor, Octahedron, as the songs are composed in a Pop-oriented orchestration but the approach to the overall sound of the music reflects the experimental nature of their earlier albums such as De-Loused in the Comatorium. The album does introduce some new influences, or at least some we haven't quite seen in a long time. Electronic decorations are much more prominent in Noctourniquet than in previous efforts, drawing a strong influence from their days in the Dub-Reggae act, De Facto. The synthesizers and rhythmic instruments, like the drums and bass, play a much larger role in the musical compositions. Instead of each instrument taking their turn in the spotlight, like in the past efforts from The Mars Volta, we find that they are instead working together to create a dense layer of sounds from instruments that create an atmosphere of ambient chaos all around, yet it's all coordinated exquisitely. And now, we arrive to the imminent questions; "Is Noctourniquet as good as their past albums?" Well, it's hard to say because Noctourniquet is driven by a different purpose than their previous work. If you, the fan, are hoping to hear Omar shred on the guitar like in The Bedlam In Goliath, or lengthy instrumental voyages reminiscent of Amputchture, this will surely be a lamenting experience for you. But to those who admire The Mars Volta for exploring different realms within musical genres and expanding their sound into new creations, this may be the album for you. The Mars Volta was bread directly from the alternative rock that played on the radio in the late 1990s. They played everything that became prosaic from the hard rock of the early 90s with an intensity that was one long adrenaline and anxiety rush from De-Loused in the Comatorium (Universal, 2003) through The Bedlam in Goliath (Universal, 2008), peaking with “Cassandra Gemini” off of Frances the Mute (Universal, 2005). They burned out on Octahedron (Mercury, 2009), and without the energy The Mars Volta became the trite 90s alternative rockers that their psychotic pace and progressive breaks laughed at, the antithesis of everything that made them special. Track by track review by NME. When talking about Dyslexicon the reviewer seems to be under the impression Marcel is on drums.